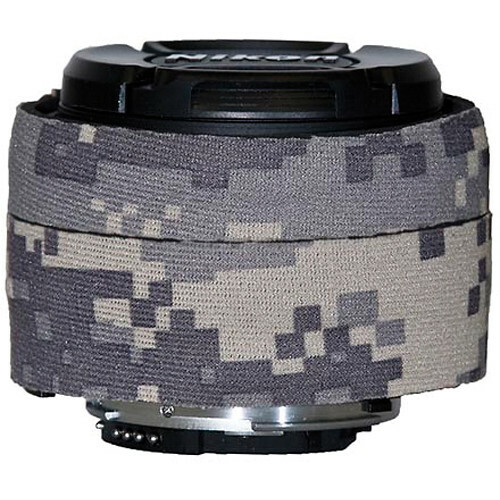 The digital army camo Lens Cover for Nikon 50mm f/1.8D AF Lens from LensCoat is a 100% closed-cell neoprene coat that protects the lens from bumps and scratches. Ideal for nature and outdoor photographers, and for sports shooters and photojournalists. It also provides a thermal barrier, protecting the hands from cold lenses in lower temperatures. The cover is waterproof, providing protection in inclement weather. It also helps break up the shape of the lens, making it less noticeable and more comfortable to hold. This classic Forest Green Camouflage pattern is ideal for general use in wooded areas. Box Dimensions (LxWxH) 7.1 x 4.8 x 0.4"
Lens Cover for Nikon 50mm f/1.8D AF Lens (Digital Army Camo) is rated 4.0 out of 5 by 4. Rated 4 out of 5 by Anonymous from Definitely buy if you value your lens I bought this to help do away with the need for camera bags and lens cases in my set-up. This lens coat so far seems fine. Construction is good, though to be honest its pretty simple, and if I'd thought about it, I could have found the neoprene and easily measured and sewn it myself, though it wouldn't have been worth my time considering how little this costs. Works great so far, only issue is when manual focusing, the coat for the focus ring slips a bit-you have to squeeze it harder than I normally would (I normally keep a light touch on focus rings like I do with a car gear stick-just how I focus). Padding was less than I anticipated, however it will be adequate for my needs as I also use a HR-2 Lens hood for protection. Of course, I haven't tested this set-up with a drop test, and nor do I want to. Rated 3 out of 5 by Ganoe Canoe from Over Priced This item consists of two very small and thin hunks of foam that fit snuggly. They are okay and they offer some protection but not for this price. Make your own with a hunk of neopreme and glue. Doubt this will show up on the reviews. Rated 5 out of 5 by Photoguytad from Great I bought this since this past week i was going to Nicaragua for a mission trip. It is rainy season and I wanted some protection for my gear. It did just that. It protected the lens from wated and scratches. Definatly worth the purchase. Even though it is for an inexpensive lens.